Antiques and old house lovers like me always have their eye out for interesting architecture. Going for a drive somewhere is elevated to a journey of discovery. Whether it is the excitement of finding something unique in old house design or the satisfaction of coming across one that is well preserved and loved, there’s bound to be something interesting or new. Whether old or new, odd as it is, it works for me. There’s still a charm and fancy to it. 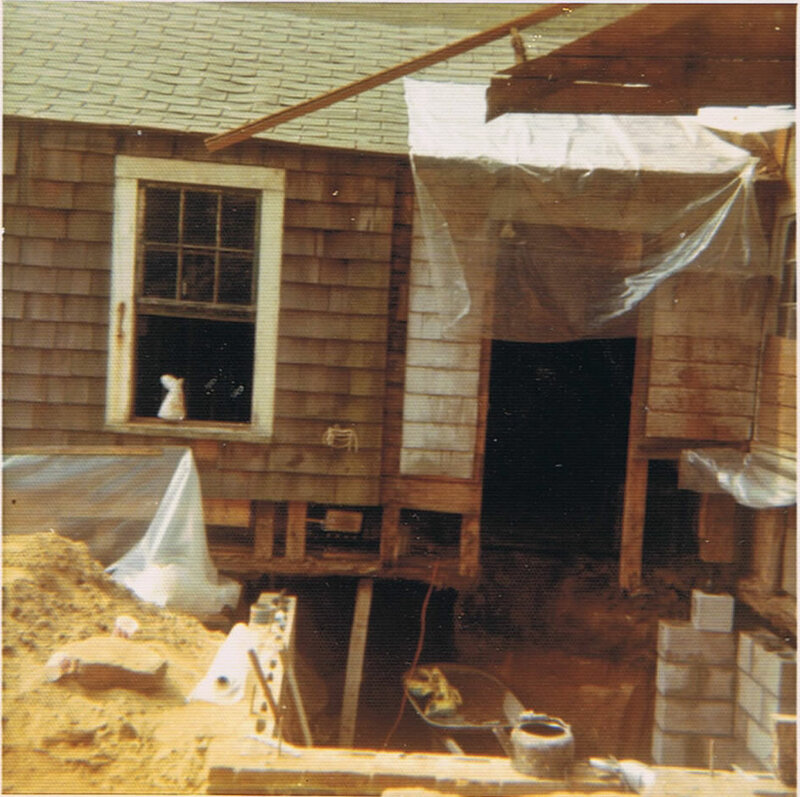 That collision of gable roof into gambrel, old materials and primitive odd chimney, the mix of clapboard and shingle, proud and sturdy window frames, crooked old door – this quirky little corner house, for me, just feels right. It’s not just the materials – which are certainly key – but the proportion, balance, the weight of it. Unlike some thoughtless additions done to old houses today, this one was thought out, each detail considered. Down the street from me there is a late 19th century home that for the past year or so has undergone renovation (I use the term ‘undergone’ as in a patient who’s undergone a terrible surgery). In original form, it was a simple, graceful, symmetrical little thing, but the new owner needed double the size. Thankfully most of it went off the back. All things considered, it could have been worse. But then, out of the blue, out of necessity to house many vehicles, a garage the size of Mount Vernon arose. Smack in line with the front of the house and dwarfing it, the three large bays face the road. Really? Wouldn’t you want to hide that? Attach it behind the house if you must, or site it in the back forty, but don’t compete with the house. There’s so much we can do to wreck the ambiance of a lovely home, to wake you from that dream glimpse into the past – but a major one that is hard to change is to build a garage (a giant one) with many bays of overhead doors and plop it right up front and next to your house. How quickly this “acceptable” renovation went awry. The builder/homeowner made a decision for convenience rather than aesthetic. When a lovely old home lies outside of historic districts, there’s not much we can do. There are no architectural police. The old house doesn’t come with directions. Micro-switches to turn on lighting can be embedded in the edge of a door casing. Can you see it? 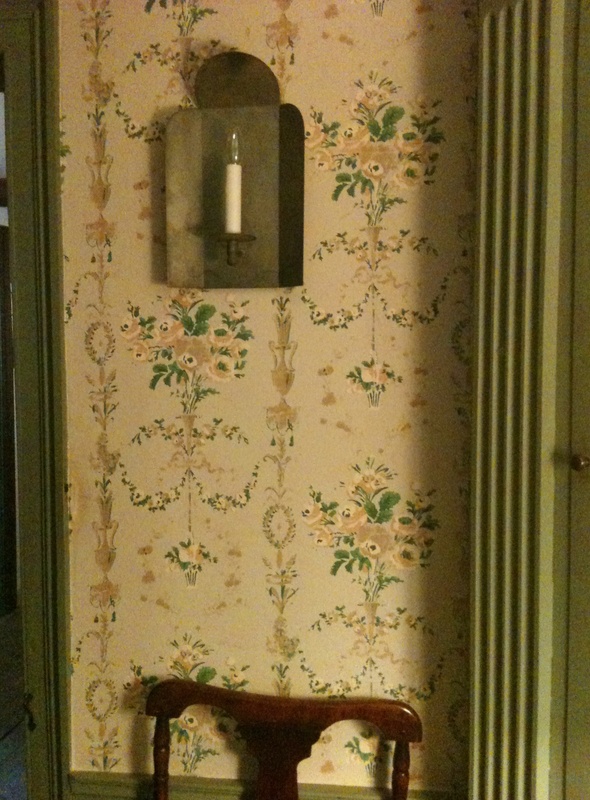 Ambiance – one of the main reasons we choose to live in an old house. 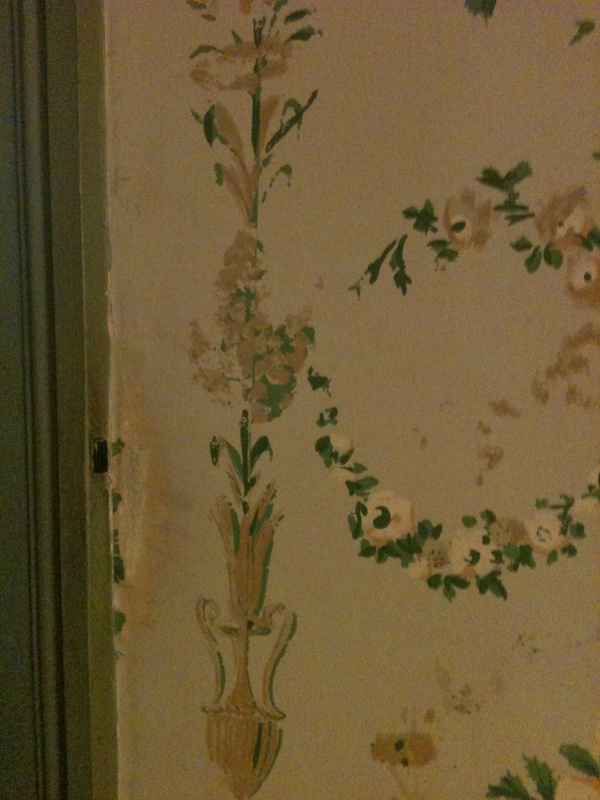 The wood, the plaster, the history, the feeling that when we walk into a room, we’ve just stepped back in time. To immerse ourselves in that and forget all that’s happening in the modern world outside our doors and small paned windows, we have to make sure that there are few, or no, traces of that world within. 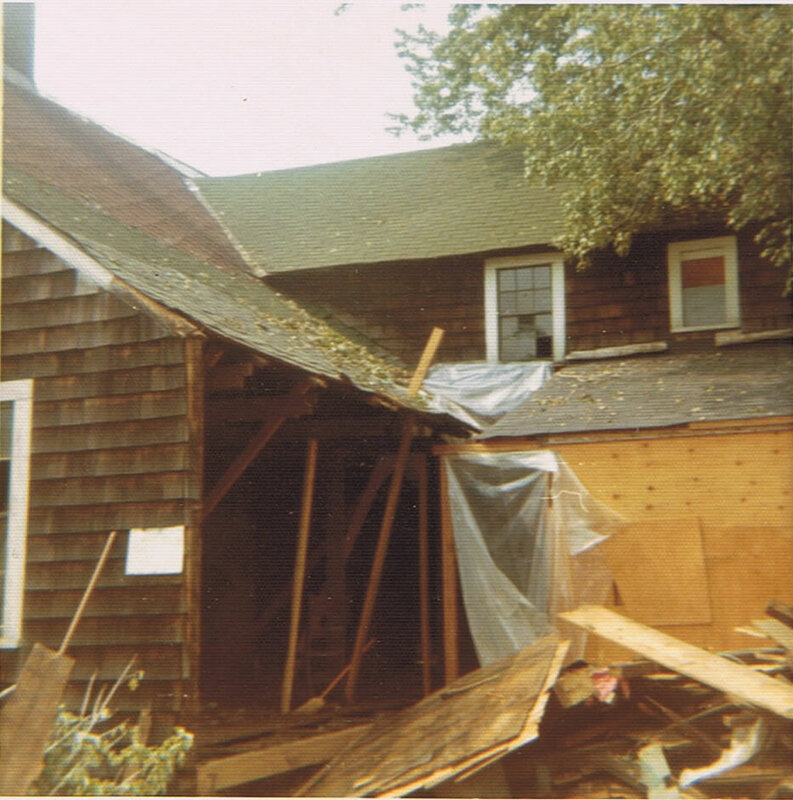 In restoring or reconstructing an old house, one has to allow as little intrusion or change as possible. If you let the harbingers of progress, aka the electricians, hvac folks and plumbers, have their way, each competing to have their craft stand prouder than the others, goodbye old house. It’ll still be there, in the basement, in the attic, behind the walls. But the intimate spaces that you treasure will be marred. I realize that some change is required, but there are ways to subdue it. However, the homeowner will have to be pro-active. They will have to walk softly and carry a big stick with the trades. Inquire as to the least obtrusive areas to place outlets, switches, heat registers. Think like a sleuth. Plan like it matters. You can’t just let the trades have a go with your rooms! A plumber, who once arrived ahead of us, went right along and cut a hole in a wide plank floor board to run a pipe. After our shock and subsequent repair we found another, hidden way. We once let an electrician, who had been with us a long time, place the electric meter on an old house without our being there. Turns out he let his apprentice do it without his direction. We were shocked to find the meter on the front corner of the house! Who does that? Someone who cares only to get the job done and move on. To them, I guess, an electric meter is a beautiful thing? Of course, we moved it around to a less conspicuous spot on the side of the house. Plan, persuade, rant and rave if you have to! To maintain the integrity of these old structures, to witness them as they once were, you always have to take the path of most resistance! And then you get to enjoy that ambiance, forever. Be careful what you wish for, right? Sometimes we run headlong toward a dream only to crash into reality. Fortunately, we were young, energized, and eager to tackle the job when it happened. I couldn’t wait to rip everything out of that house that didn’t belong. Beaverboard covered beamed ceilings and featherboard walls. Newer, shallower fireplaces covered deeper ancient ones, wallpaper covered paneling – and black soot covered everything. There was a huge coal fired cooking stove in almost every room, with the familiar hole cut out of original paneling to vent it. 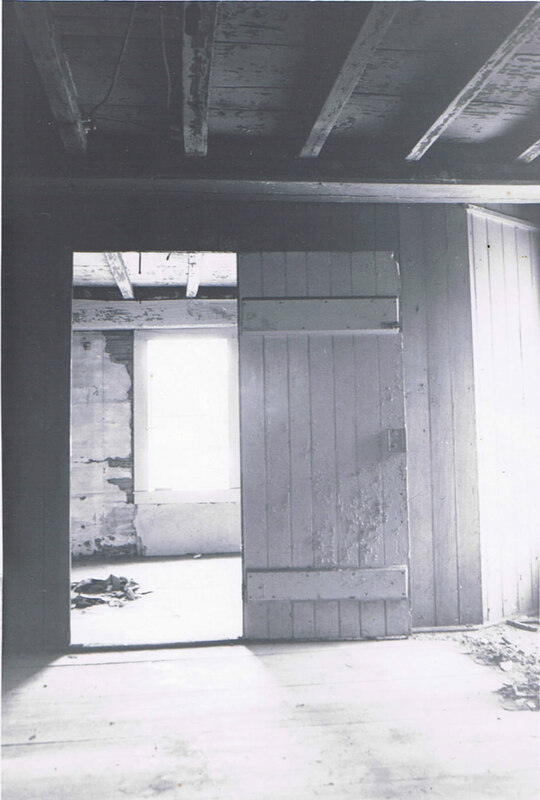 Floors were bowed, and original boards lost at the first floor – that awful narrow tongue and groove replaced them. Even those were painted and rotted. In every room the floors leaned toward their sills, which were obviously termite ridden. There were three magnificent doorways on the house, but their original doors were missing. All of the windows were replaced with six over six’s. They were made larger, which cut into the interior woodwork. There was no heat or plumbing or electric. But that wouldn’t deter us. There were treasures to uncover. And besides, we had just come from a project where, for a year and a half, we had lived with an outhouse in the woodshed and a pump outside for water. We could handle this. With a ten dollar table saw from a neighbor, a few tools and a lot of gumption, the journey began. Here are some photos I’ve found. Wish I’d taken more back then – especially with those monster cook stoves – which a local flea market merchant was so kind to take off our hands. No easy task, moving those behemoths. One of the first things we had to put in was, of course, a bathroom. Since our budget didn’t allow for much more than purchasing the house, we would have to do everything. By hand. Here is a shot of the back of the house after taking down the later woodshed. Yes, we’d be going out to the woodshed again, to use the bathroom. But at least this one would be attached and have running water. The big hole in the ground was dug by hand, by Edward, with a little help from a friend. Then he constructed the cinder block foundation, block by mortared block. No matter how much progress you think you’re making with an old house, sometimes, it seems there are as many steps in reverse. The more you uncover, the more work you see ahead of you. 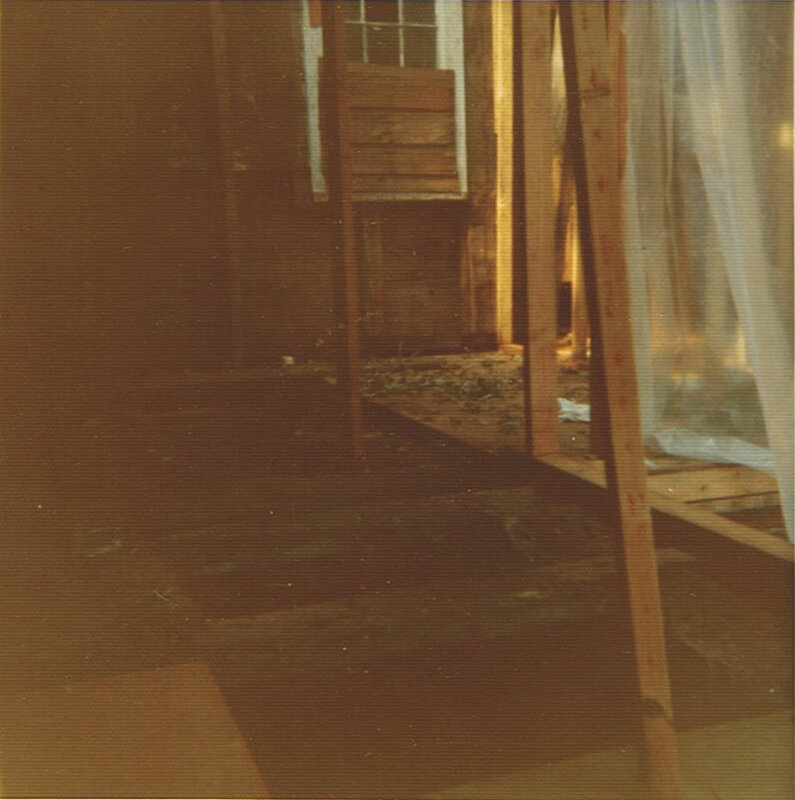 Another sill, or rotted post, and everything being connected – another stud to replace, or joist rotted at the end, or girt whose rafters no longer reach…and on it goes. Thank God for the treasures! And the youth. 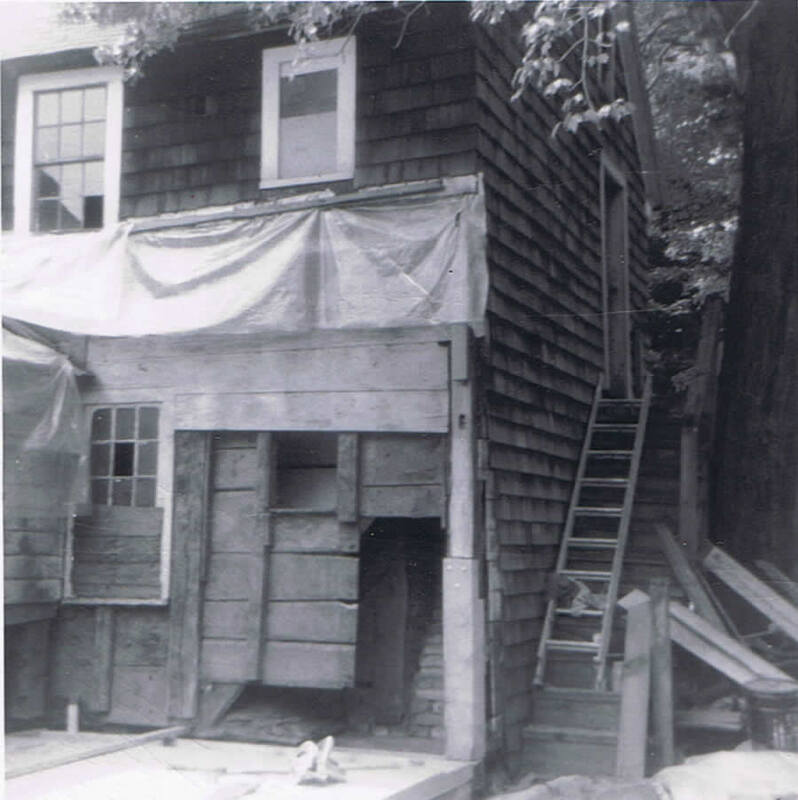 This photo shows the hole covered and deck on, and the exterior wall of the original 1720 two story ell. A picture’s worth a thousand words – but I’ll probably say them anyway. The stair at the back of the house was for one of the many “renters” who lived here over the years. Through the wall sheathing you can see the the back of the original chimney and a bit of the construction of the interior back stair. My favorite part of the whole house – a narrow two panel door in the paneling leads to this primitive back stair with exposed and whitewashed studs and joists. As as you wind up the stair, there’s a landing with a built in bookcase which has aged a deep chestnut color. 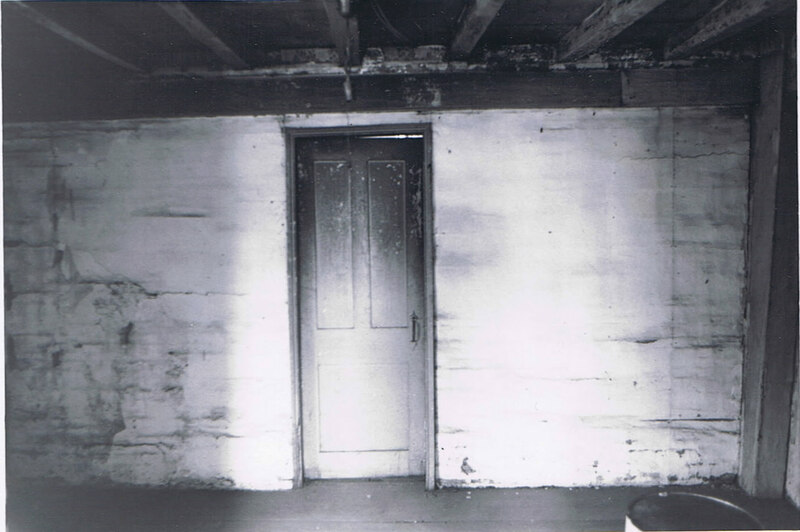 And on the featherboard wall beside it, there is faded writing, some of which says “war of 1776.” This entire stairwell area is lit by a casement window, boarded up in the photo. Years later, this stair is how our little one would get to her room at night. Instead of candles as in the 18th century, she used a flashlight. As I said, one thing leads to another. Not until you uncover it all, do you see the extent of the work. Here is the back wall of the lean-to section of the house. 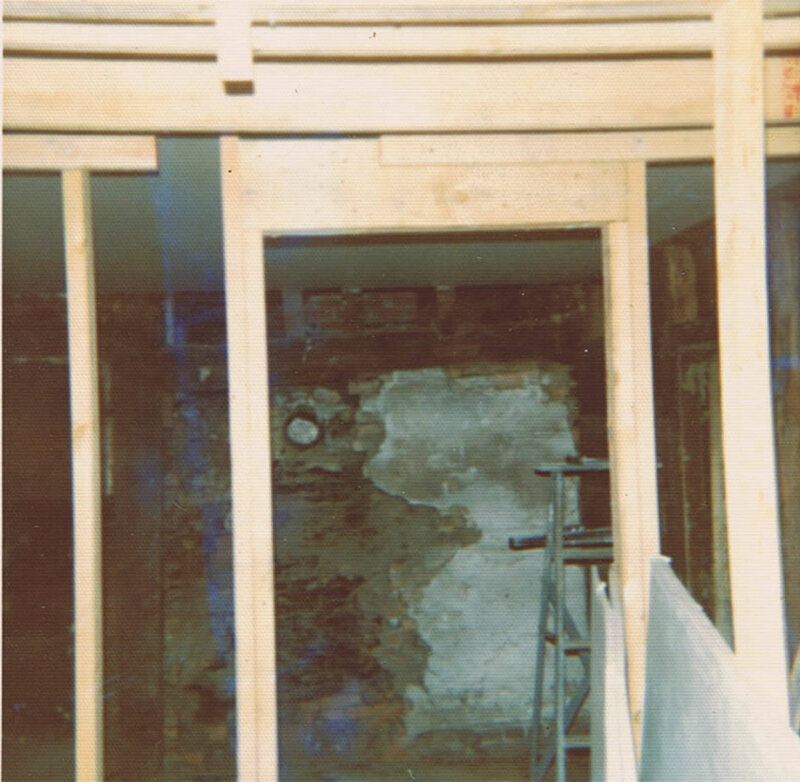 By the way, the original two story section of the house was built in 1698, the two story ell was erected in 1720 (we found writing on the joists) and discovered the timbers were re-used, they came from an earlier house. 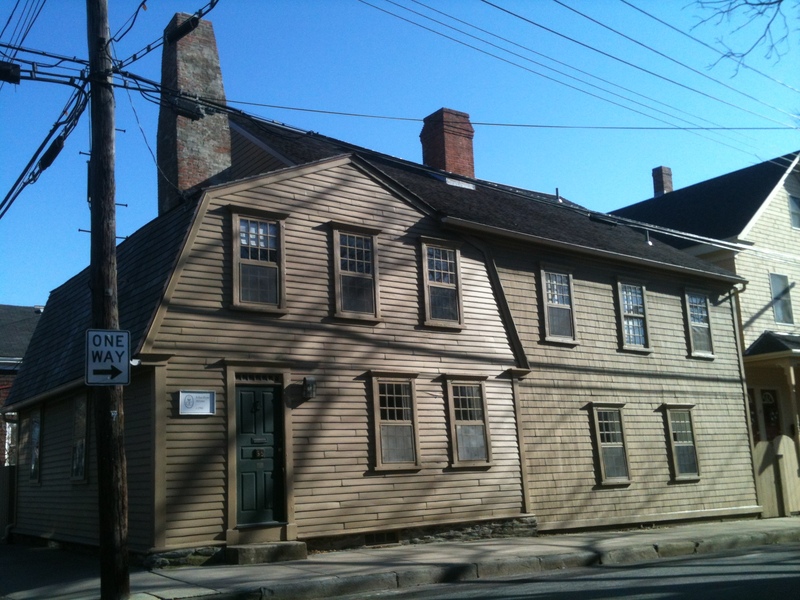 And the lean-to, that makes it a saltbox on one side, was put on around 1760. Meanwhile, we had to remove the entire back wall, replace the girt, re-engage the joists into the new one, replace the sill, and re-stud. One scary event – this wall was open, with plastic covering it overnight. We were away – and a tornado came through our neck of the woods that day. We thought there’d be nothing left – but fortunately it missed us. I know – it looks like it hit us! The hole where our future kitchen will be. Another hole for – guess what? We would add a small kitchen fireplace here, and a paneled wall. More interior shots. We have our work cut out for us. Original paneling, with a hole where that darn stove was vented. 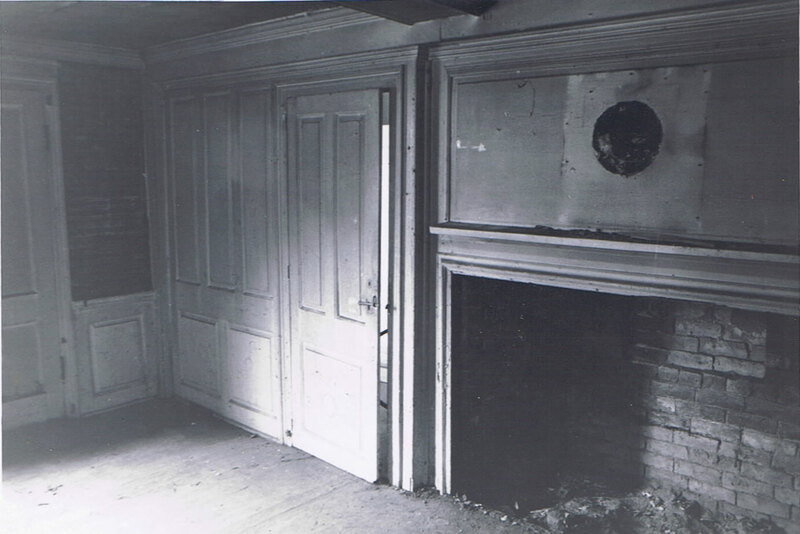 To the right of this fireplace is the door to the “secret” stair. 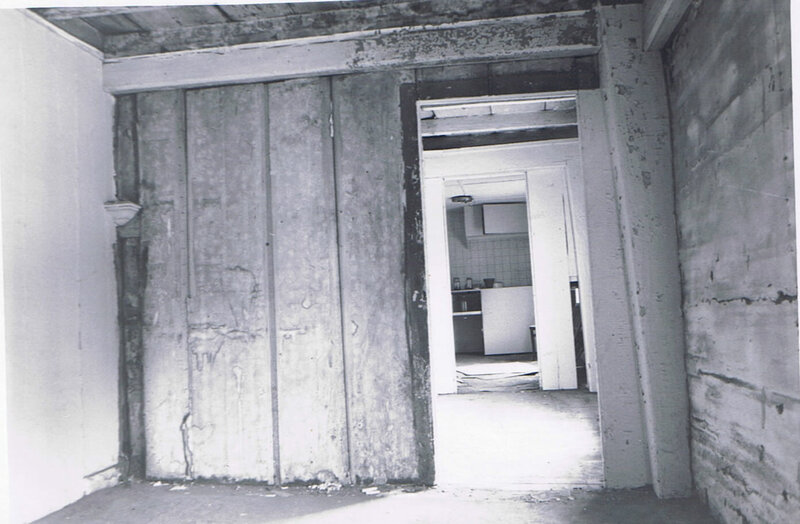 A section of the room that was the original kitchen. We’ve removed that old beaver board (forerunner to sheetrock) to expose original horizontal featherboards. I love this shot. This is the upstairs front bedroom. It had been divided into two rooms by this wall which was constructed across it from the fireplace to the window. They had to slant the wall, as though they’d built it across and then said “oops!” The original plaster still barely clings to the walls and the whitewashed beams are exposed. Awesome! On the left you see the backside of that wall that divided up the room – and the bit of fireplace mantel showing! Imagine building a wall right into the decorative mantel?! 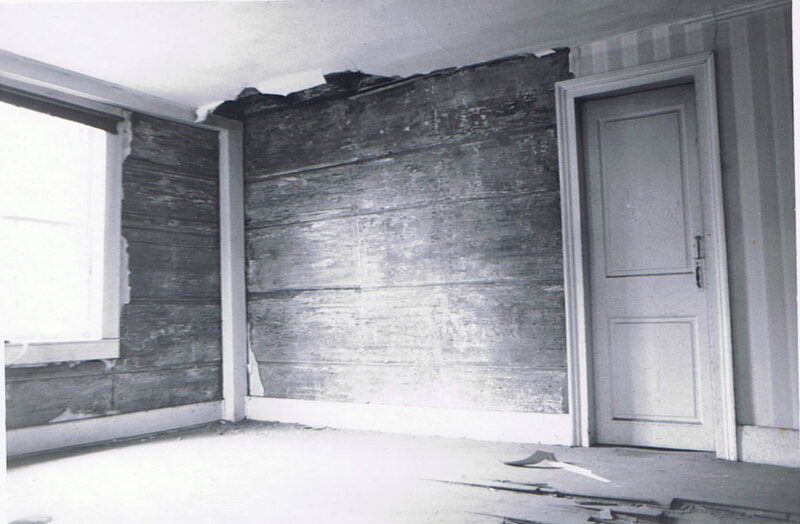 Note the featherboarding covered with wallpaper – and the gunstock post to the right. Through the hallway you can see the “apartment” they created in the other front room. 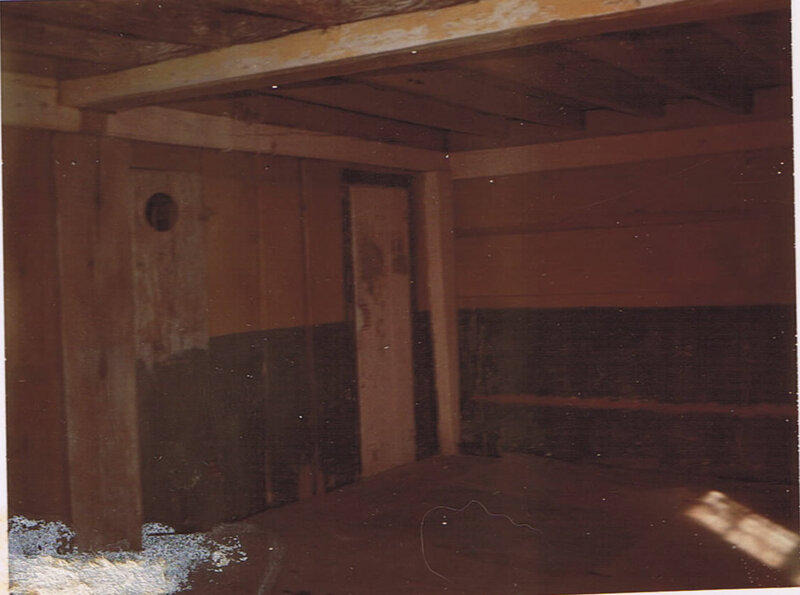 This room also was divided, painted six different colors, and a crude kitchen added. Here’s an old polaroid I found. Another room, another stove, another hole. The room may be pink and green and yellow – but it’s all wood. Original featherboard doors are still in their places, opening to tiny closet spaces. The original flooring at the second floor is big and beautiful and wide, and serves as the ceiling of the first floor below. And all of this, the heaviest, dirtiest work, Edward did alone. I was working during the day to help buy materials, and food for the project. Then nights and weekends were my turn. He was still an aspiring musician/songwriter, and that future hit song was going to pay for the rest of this restoration! Those were the days. One of the many travels in pursuit of a music career took us to London – right after we bought the house. We (and the band) came back with a record deal several months later, well, it was the promise of a deal – with just some fine print to work out. Two weeks after our return, they called to say they could sign only one act right now – and decided to go with an obscure band from Texas – by the name of ZZ Top. After two more years, spent in Los Angeles, and some interesting times, we came back with our infant daughter, and resumed the restoration – without the help of that million-dollar hit single. Instead, LA handed us another “almost.” While there, the manager spent the advance money, which was to record that single, on a house for himself. It’s a long story.